January | 2010 | Boulder! Praktiškai dokumentika apie Natalija Gros ir laipiojimą viskuo t.y. akmenim, pastatais, tiltais – žodžiu WATCH IT! Spausk čia jei nori KLIMB SOFTWARE! Boulderio varžybos Švedijoj. Hmm… verta pagalvot, nes ir netoli ten rajonas geras boulderingo. Varžybos vyks liepos 31d. – rugpjūčio 1d. Malmės miesto centre po atviru dangum daugiau info Sweden boulder. “I started climbing with my father in many outside areas like “Gorges du verdon”, “Chateauvert”, “Rodellar”, “Ceuse” since I was 7 or 8 and every week end in crags around our home. I was just climbing to forget all the bad week I had in school 😉 Then one day when I was 13 or 14 I decided to train to be better on rocks and so on…train for comps. No training program for the moment, just climb. Maybe half of the week inside in Aix with Paulo Dewilde who helps me a lot and then half outside on rocks and a lot of trips too. But climbing and having fun is the only way for me which brings good results. Between 2003 and 2007 I was a pole vaulter 🙂 I was sick by bad people and bad energy around me in limbing. So I did pole vault and good results on that but last year I just missed climbing. 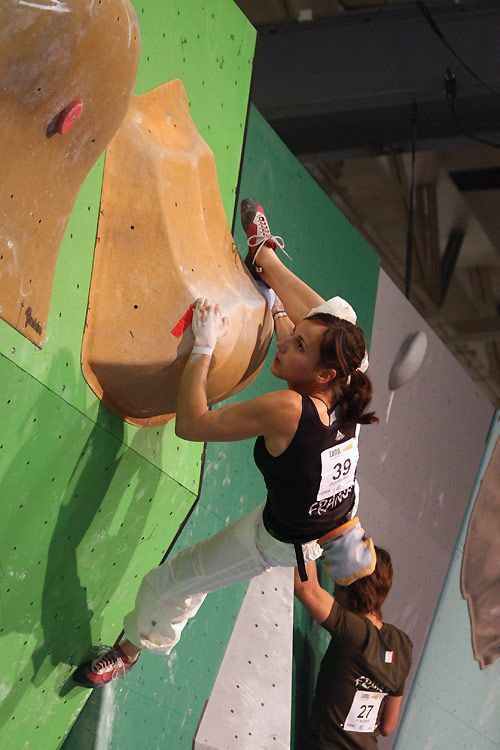 Now I m so happy to do it again and I’m meeting people really nice who love climbing and make me feel good.